This charming Trullo with his typical cone roofs, is located in the beautiful scenery of the Itria valley. Idyllic surrounded by palm trees, olive trees and many Mediterranean plants and flowers, this house is an ideal place for a romantic holiday. 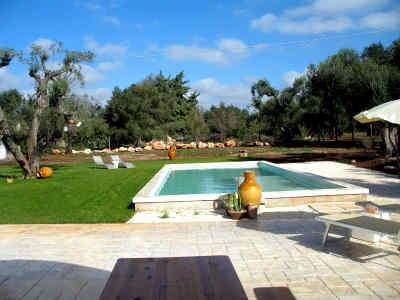 Much space offers you the sun terrace overlooking the hilly area with some isolated Trulli. Trullo Carperi is very lovely and devided in a living room with open kitchen, a double bedroom and bathroom. The house beside Trullo Carperi is usually occupied only in August. Famous places like e.g. Ostuni, Alberobello and Locorotondo are not far away and very comfortable to visit on day trips. And the beautiful coast of Puglia, with sandy beaches and rocky coves, is even quick and easy reachable by car. The nearby and charming old town of Cisternino offers in the small and characteristic alleys many nice bars and restaurants. The prices are inclusive water, gas for cooking, current, bedlinen, towels, final cleaning. Urheberrecht © 2018 Puglia-Holiday.co.uk Alle Rechte vorbehalten.